These are also the recommended default Speed Up Settings for Wiimote Controllers. Check the box to the Left of 'Enable DualShock 4/Wiimote Bluetooth searching'. The recommended Speed Up Settings when using a Wiimote with a Bluetooth 4.0 USB Adapter are as above - you can choose to tweak with them if you have any issues. If you have a slower Bluetooth adapter or experience any issues with rumble then you should try different 'Rumble Over Bluetooth' speed settings. You have the alternative options of Flow Control+, Flow Control and Disabled. Hold down the 1 and 2 buttons as the same time. The LED on the controller should start blinking, meaning the it's trying to connect to the CronusMAX PLUS. Wait until only one LED remains. If the controller turns off hold down buttons 1 and 2 again. 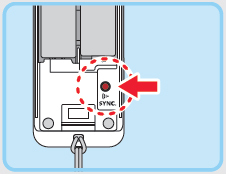 If after a few attempts your Wiimote still does not connect, try the sync button (red button on the back of controller). 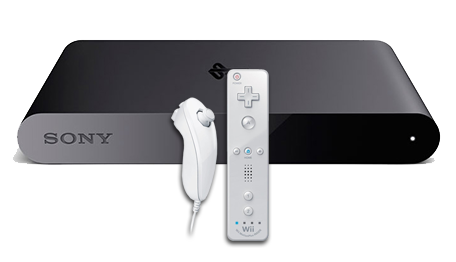 Remember, you must use a compatible motion sensor bar for the Wiimote to work on your PlayStation TV - click here to buy one in our store. You will also need to load a script to correctly map all of the buttons and sensors. We highly recommend this one. 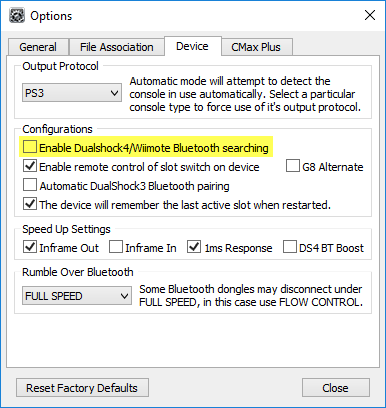 If you do not intend to use your Wiimote controller without the CronusMAX PLUS in the future, you can now disable Wiimote Bluetooth searching to speed up subsequent wireless syncing.